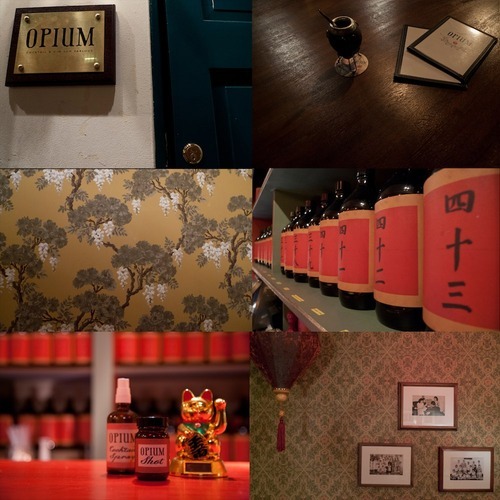 “Am having a drink in an opium den”. Not the sort of thing that my mum was expecting when she texted me, asking me to call her regarding Easter Sunday plans the next day… but, well, it was the truth. Sort of. My friend and I were feeling on a bit of a roll after having dined out in Flat Iron: the night was still young, there was still a lot to catch up on, we weren’t drunk yet… we needed a suitable venue in which to continue the evening’s pleasantries. And so, upon her recommendation, we decided to check out Opium Cocktail & Dim Sum Parlour. It’s located up some stairs behind a plain jade door on Gerrard Street, right in the middle of Chinatown, so I’m sure the various tourists milling around were somewhat bemused to see us meet-and-greeted by the imposing bouncer, and then let into a secret and exclusive world of Chinoiserie and Orientalism. As befitting a den of iniquity (the dim sum’s influence, obviously), the lighting was dim and moody, but the décor was cleanly presented and well-executed, giving a real ambience of fun Eastern ‘exotica’. We had some seats by the bar in the Apothecary, facing the mystery bottles lined up along the back, distinguished by the Chinese numbers adorning them. Sitting at the bar afforded us great views of the show that the mixologists were putting on. So, what did we have to drink? Later on, after having watched several being made and being extremely intrigued, I succumbed to the pressure and had the Opium Cocktail No. 2 as, well, my number two cocktail. 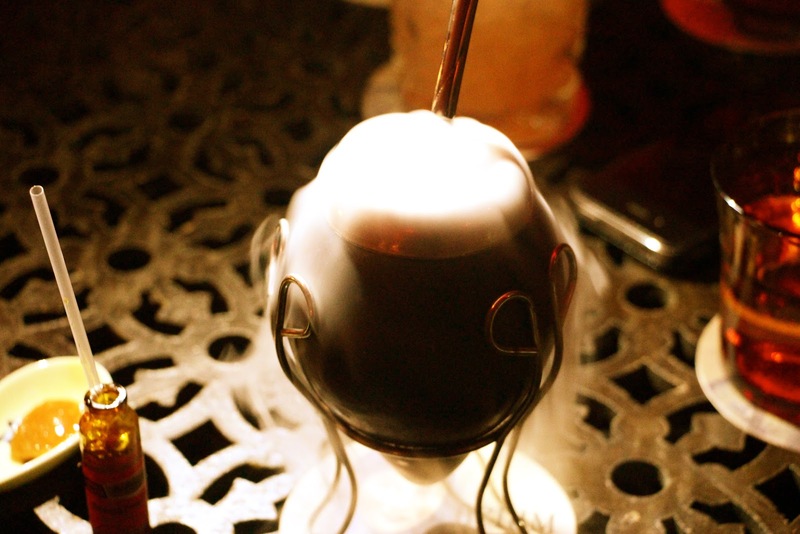 This came in a little, smoking cauldron and was accompanied by a tiny bottle of ginseng which would act as a chaser. It was a fascinating sight to see it placed before me, and my friend and I ooh-ed and ahh-ed as we explored every aspect of it. Alas, they did not have guava jam at the time, but I was assured that the next time I came here, I could use it to offset the bitterness of the ginseng chaser. Overall, it was good evening of convivial conversation and fun drinks in a rather relaxed and cool setting. We even got to try the crab and samphire dumplings (very tasty, slightly unusual because of the samphire, but you can get cheaper and just as good elsewhere), just so that we could say that we came to Opium and did BOTH cocktails and dim sum. Cocktails and dim sum… it is a winning combination. VERDICT – Highly recommended. As I was discussing with someone else recently, it is a bit hard to find a relaxed yet cool place where you can go for really good and interesting cocktails and not be drowned out by the loud music or other groups. The staff here were all really chatty and quite clearly enjoyed what they were doing. When you’ve got all those ingredients thrown into the mix, how can you not enjoy yourself?